Children 5 to 12 years of age (PDF). Children under 5 years of age (PDF). Read these tips in 10 other languages. 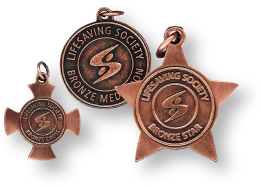 The Lifesaving Society's online store is open for business. Enjoy the convenience of 24/7 shopping. It's all here - from first aid and pool supplies to everything required for lifesaving courses and training. Visit www.lifeguarddepot.com now! Watch the On Guard card video. 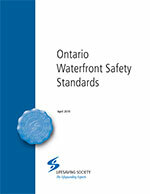 The 2019 Ontario Waterfront Safety Standards reflects the Lifesaving Society's position on the safe operation of public waterfronts in Ontario. It is a required text for Lifesaving Society Aquatic Safety Inspector and Auditor certifications, and for the Society's Pool Operator courses. All waterfront owners should have a copy. Order a copy today. Register now for this one-day Lifesaving Society symposium, where experts will bring the most up-to-date information on the design and operation of healthy, safe swimming pools. Hosted by the City of Toronto. Download the flyer. For more information, email Ann Palmer or call 416.490.8844. Are you an experienced examiner who has completed a minimum of three exams? Do you have a desire to coach and support examiner candidates? If you answered yes to these questions, then becoming an Examiner Mentor may be for you. Learn more here or fill out the Examiner Mentor application. 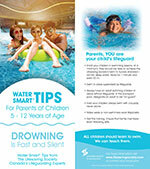 Our Water Smart Tip Cards in English, French and 10 other languages, address essential drowning prevention topics with tips to stay safe. Order now in lifeguarddepot.com. 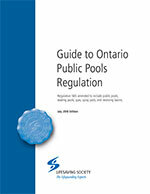 The revised Public Pools Regulation 565 includes public spas, wading pools and receiving basins. 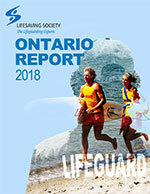 The Lifesaving Society has revised its Guide to Ontario Public Pools Regulation to help aquatic staff members understand and interpret the updated Regulation. The Guide outlines the “Regs” in simple language using everyday terms understood by aquatic personnel. The revised Guide is available now for $44.52 tax included and free shipping. 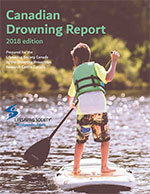 The updated 2018 edition of the Ontario Program Guide makes it easier than ever to quickly find the information required to deliver Lifesaving Society training programs – including the Society’s revised leadership courses. The ever-popular Prerequisites-at-a-glance is still located on the inside back cover. The Guide is an essential component of every aquatic programmer’s reference library. 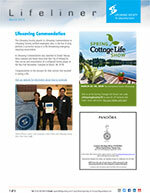 View it online or purchase hard copies from the Society’s office or at lifeguarddepot.com. STARTboating is designed to teach basic boating and water safety skills. The program is availalble in multiple languages. Get all the info here. A report by the World Health Organization (WHO) says drowning is among the top causes of death for children worldwide, and programs like the Society's Swim to Survive could have immunization-like benefits. Read the media release and get the facts. The WHO report identifies drowning as a major public health issue and calls on the world's nations to ramp up drowning prevention efforts. 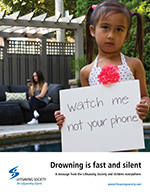 Read the WHO media release and read or download the Global Report on Drowning: Preventing a Leading Killer. 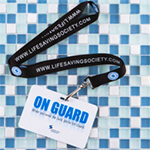 The Lifesaving Society's new Safeguard certification provides safety supervision training for guardians like day camp counsellors, counsellors-in-training and others who accompany groups of young people to pools or waterfronts. The course stresses the responsibility undertaken by these group leaders for safeguarding the young people in their care even when under lifeguard supervision. Visit Safeguard for more information. Visit LifeguardDepot.com to purchase the Safeguard Program CD. View the Safeguard Handout. 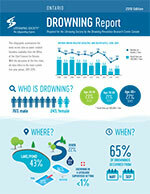 A growing body of research explains why teens may be at increased risk of drowning - based on new poll findings, Lifesaving Society cautions parents and offers training with Swim to Survive Plus™ Get all the info. Thanks to our sponsors: The Stephanie Gaetz Keepsafe Foundation, Ontario Trillium Foundation and PPL Aquatic, Fitness & Spa Group Inc. and the Papke Family.